Overhauled bikes, which get completely taken apart and rebuilt. As-Is bikes, which are safety-checked and made ready to ride. 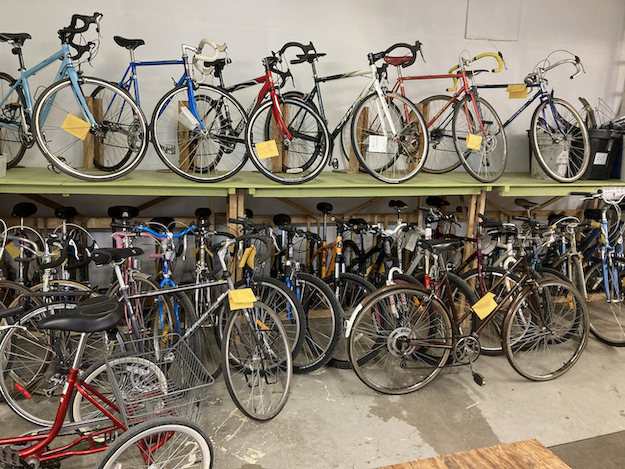 From time to time, we also donate some of the bikes we've repaired to charitable institutions such as shelters and overseas volunteer organizations. We have a decent selection of used parts, mainly shifting and braking components, and usually lots of knobby mtn. bike tires. While our spare parts are often used to refurbish our bicycles, we usually do have a surplus for sale. Check out the photos on our Do-It-Yourself page. Overhauled bikes are completely taken apart, cleaned and greased, and then reassembled. Every part and assembly is itemized and checked on a worksheet. While we mainly use second-hand parts, we strive to ensure these parts are in good shape. Once overhauled, bikes are road-tested by a Head Mechanic and placed in the For Sale rack. We attach the worksheet that lists the work done on each bike, and each one has a limited warranty. Prices for overhauled bikes start around $140. Our As Is bikes are assessed by one of our Head Mechanics, with a check sheet that shows the condition of various major components. These bikes are made safe and ready to ride, and are of course the cheapest, starting at $60. These bikes are great for those who are on a tight budget or want a bike that works just fine, even though it's not "perfect". NOTE: Please only bring in donations during our open hours, or during those of our partner Cycle Salvation when they are using our shop. Please do not leave items in our doorway / driveway. We understand that some folks just want to be rid of their bikes and don't care if we end up with them or if someone takes one from our driveway, but it can cause bad relations with our neighours if they are disturbed by someone sifting through or dismantling a bike on our property. In the case of one or two bikes, we regret that we currently cannot come and pick up your donation. In the case of a large quantity (say, from an apartment building getting rid of abandoned bikes) we may be able to make arrangements to have these up picked up. Any useable parts, like wheels, tires, seats, even tools. Your old chain might be too stretched, but we have a source that will turn it into jewelry! Your old toothbrushes; no really, we do want them - they are great for cleaning parts! Clean rags. UPDATED! Please, only cotton sheets and towels. (Clothing is problematic for us and should go to your local thrift shop.) If you can pre-cut / shred any sheets or towels into roughly 12"x12" squares that would be amazing! Old helmets, child seats, Camelbaks and other water storage devices and bottles. These are all personal or safety items that should not be reused, and we won't re-sell them.